By The Irving Air Chute Co. Part No. AN68642-1 ALT2'. Parachute Assembly, Quick Attachable Chest, Type AN-6513-1A. White webbing harness with a central black fleck. Fitted with the early 'dog-clip' style fastenings rather than the later quick-release box. Complete with correct horsehair filled backpad/cushion. The harness is clearly marked and dated 'MAR 12 1943'. 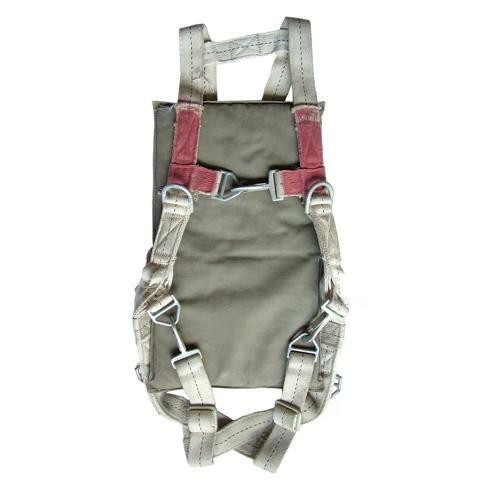 This type of harness was worn extensively by ball-turret, tail and waist gunners who stowed their packs within the aircraft and clipped them on when required. These are technically Group 1 'Red' parachutes with cadmium plated metal loops on the harness. The corresponding pack has snap-hooks which engaged these metal loops. Pack shown in photograph no.10 for illustrative purposes only and is not included in this sale. It is listed for sale separately. The webbing is a little soiled, has minor fraying and is 'Group 1' red marked. There is a small frayed split on the side of the backpad - see photographs. Good '+'/very good used overall. Another rare find. Stock code S22946.